Great start to our home for the holidays kitties! | The Kitten's Cradle, Ltd.
Great start to our home for the holidays kitties! Wow, what a great start to the holiday season… We had 3 of our special home for the holidays special adoptions happen today with huge congrats going out to our girls, JEWEL, GRACIE AND TORTELLINI! Add in a few youngsters that got their own amazing homes as well! Congrats to the adorable Meleah and Paisley! 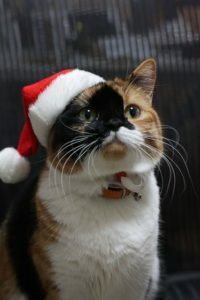 Don’t forget everyone we still have some amazing adult kitties waiting for their holiday wishes to come true and to help them out we will continue to offer our 1/2 price adoption fees on all adults!